Dumoulin wins stage four in Etoile de Besseges, then un-wins it. The Twisted Spoke crystal ball, the one we got a wanderinggygpy.com, is proving highly effective. After citing Samuel Dumoulin’s aggressive riding style in his stage three win, the micro Frenchman was back in action the next day in the Etoile de Besseges. 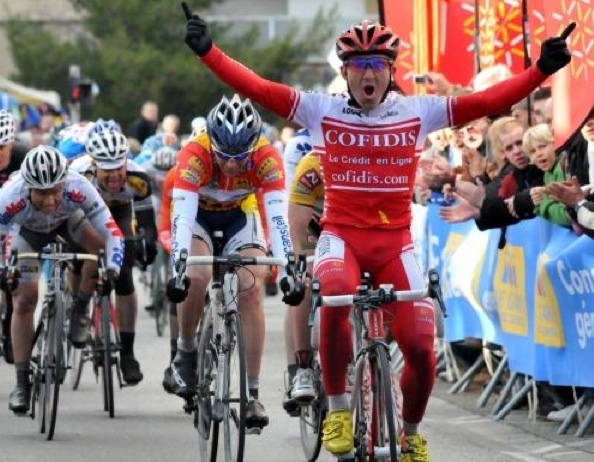 However, the small rider for Cofidis Credit en Ligne made a big mistake this time around. You can cut corners to win a race, but not literally, mes amis. Sammy, fait attention! Despite beating Arnaud Molmy (Team Roubaix-Lille Métropole) across the line in the 140k run around Gran Prix d’Ales en Cevennes, the race commissaries decided Little D was a tricheur, a cheat, for having cut the course in the final kilometer. How, exactly, Dumoulin accomplished this trickery was not revealed — secret back alley, unfair use of sidewalk, cutting though neighborhood bakery? The upshot was Arnaud landed in first place and Dumoulin was relegated to cycling Siberia. “Dumoulin wins 71st place” doesn’t grab much attention in the Le Monde sports page. Adding insult to injustice (perhaps) Molmy also inherited the overall race lead from Borut Bozic, who started the day with a 16 second advantage over Niko Eeckhout (An Post – Sean Kelly) and the two wily Frenchman. Sammy D, no more hanky-panky, mon ami. Just because you are small and sneaky, do not think the judges will miss your little games. It you are Mark Cavendish, perhaps they cut you some slack. But Dumoulin, bah non. « Tom Boonen in Arab disguise before start of Tour of Qatar.